This marathon was on a 13.1 mile course that was repeated twice. The course started at the Eisenhower Visitor’s Center and was basically shaped like a three-leafed clover, with two of the leaves repeated for each round of the course. It was a little confusing, but there were course monitors that made sure we went the right way. The volunteers at the aid stations were very helpful, and there were course monitors riding horseback along the far end of the course, which was along the old Chisolm Trail. The medals were a play on the “I Like Ike” buttons which were very nice. They had food at the finish, but I skipped that part because of the need to shower before my late check out time from my motel. 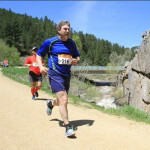 All in all it was an enjoyable weekend, and the organizers asked for feedback from the runners so they could continually improve the experience. Very flat, very fast. I’ve ran this marathon 4 years in a row, and am getting ready to go back for a 5th year in a row. I’ve gotten a new Masters PR every time I run it. I’ve BQ’ed the last 3 times I’ve run it. The weather is cool, but never too cold. It hasn’t gotten too hot, finish temps are usually low 60’s. It’s the best supported marathon I’ve run, with aid stations every mile. It’s small, but that means no long bathroom lines, and I was able to park about 50 yards from the start/finish line. It’s wide open, out in the country, so the air is clean and fresh. I didn’t think I would like the double out-and-back course, but now I LOVE it. We get to see all the other runners in the race, several times. Going back out on the course after the 13.1 turn around can be mentally tough, but that does’t last long when you see the other runners. Once you get to the 19.5 mile turn around, all you have to do is get home, and that doesn’t seem too daunting. And you get a nice gradual downslope at 23 miles, when your legs are killing, and by that time you can see the town, and know the finish is very close. At the finish line, it’s all you can eat pancakes and sausage! Wow, sounds like an excellent choice for my Kansas marathon! If so, I hope the Eisenhower PR and BQ are contagious. ;) Thanks for the excellent review Dean, and hope you were able to set another master's PR and punch your ticket to Boston in Abilene again this year. We'd love to hear about it! Another year (#5) and another great race! I didn't quite PR this year, but I did get another BQ easily, by 8 minutes! This race keeps getting better every year, and I'll be back next year! Nice job, congrats Dean! I've added the Eisenhower to the future races on my Staging Area page. Hope to see you there when I make it out to Kansas!